AICGS is pleased to welcome Sonja Thielges as a DAAD/AICGS Research Fellow from mid-March to mid-May 2019. In Germany, Sonja is a research associate in the project “Pathways to Sustainable Energy” at the Institute for Advanced Sustainability Studies (IASS) in Potsdam. Sonja’s research interests include the international dimension of the energy transition, foreign energy policy, the G20 energy agenda, as well as U.S. energy and climate policy. Her research has been published in studies, policy papers, online blogs, and academic publications. During her fellowship at AICGS, Sonja will explore foreign policy interests in Germany and the U.S. related to the countries’ energy transitions. Germany’s energy strategy, the Energiewende, envisions the phase-out of nuclear energy and fossil fuels. The goal is to create an energy system based on renewable energy and energy efficiency in order to reduce the country’s energy import dependence and protect the climate. The U.S. has been witnessing an energy transition as well. The “shale revolution” has enabled the country to tap domestic oil and gas resources on a major scale, reducing its energy import dependence significantly and turning it into an exporter of oil and gas. And although renewable energy production has also expanded, the Trump administration’s Energy Dominance strategy aims to capitalize mainly on the country’s fossil resources. Germany and the U.S., it could be argued, are headed for different energy futures. This can bring about different, possibly conflicting, foreign policy interests, instruments, and strategies. Sonja’s project will analyze the implications of these energy transitions for the transatlantic partnership. Supported by the DAAD with funds from the Federal Foreign Office (FF). Sonja Thielges is a DAAD/AICGS Research Fellow from mid-March to mid-May 2019. In Germany, she is a research associate in the project “Pathways to Sustainable Energy” at the Institute for Advanced Sustainability Studies (IASS) in Potsdam. Sonja’s research interests include the international dimension of the energy transition, foreign energy policy, the G20 energy agenda, as well as U.S. energy and climate policy. Her research has been published in studies, policy papers, online blogs, and academic publications. Prior to IASS, Sonja worked in the Americas Division at the German Institute for International and Security Affairs (SWP) in Berlin, focusing on U.S. climate and energy policy. She was a visiting researcher at the University of Michigan’s Center for Local, State, and Urban Policy in Ann Arbor in 2014 and previously also worked on projects at the Environmental Policy Research Centre (FFU), the Institut für Europäische Politik (IEP) Berlin, and the Centre International de Formation Européenne (CIFE). 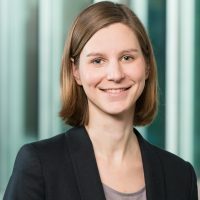 In 2017/2018, Sonja was a participant in the AICGS project “A German-American Dialogue of the Next Generation: Global Responsibility, Joint Engagement,” sponsored by the Transatlantik-Programm der Bundesrepublik Deutschland aus Mitteln des European Recovery Program (ERP) des Bundesministeriums für Wirtschaft und Energie (BMWi). She completed an M.A. in North American Studies, Political Science, and Modern History at Freie Universität Berlin and Indiana University Bloomington. She is a PhD candidate at the John F. Kennedy Institute for North American Studies. Her PhD thesis studied climate policy discourses in the U.S. Rust Belt states. During her fellowship at AICGS, Sonja will explore foreign policy interests in Germany and the U.S. related to the countries’ energy transitions.